How do Humpback Whales and Minke Whales Eat? How do Humpback Whales and Minke Whales feed? Whales can come in all shapes and sizes. The smallest whale in the world, the vaquita, grows barely larger than a 10-year-old child. Meanwhile, the largest whales can grow to be larger than a city bus, longer than a basketball court, and even as long as a Boeing 737 passenger jet! Despite being so large, some of these massive marine mammals maintain their size by feeding on tiny animals, many of which are only the size of a paperclip. Picture: The size of a Humpback whale compared to a diver. Whales, dolphins, and porpoises are all classified as cetaceans, which evolved from land animals over the past 50 million years. Scientifically, cetaceans are classified into two groups: the toothed whales, and the baleen whales. The largest whales are baleen whales, but size isn’t the best way to distinguish between the groups. Instead, we should look inside their mouths to determine which group a whale belongs to! 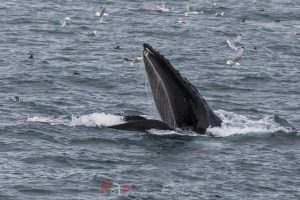 The 2 most common baleen whales we see on our whale watching tours from Reykjavík are the minke whale and the humpback whale (See more about Humpback whales in our blog about how to identify Humpback whales). These species migrate thousands of miles every year, or almost every year, to come to Iceland and feed in our nutrient-rich waters. This results in spectacular sightings which may occur throughout the year, but sightings reach a peak in the summertime. A feeding baleen whale is an amazing and often dramatic sight to behold! 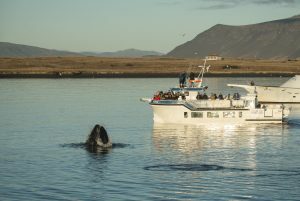 Both pictures show a feeding humpback whale seen on a whale watching tour from Reykjavík with Special Tours. These baleen whales don’t have any teeth – and that’s because their remarkable way of feeding has made teeth useless. Instead, they have long strips of keratin (the same material our hair and fingernails are made of) which hang down from their upper jaws, inside their mouths. These strips are called baleen plates, and the whales use them to filter out their tiny food from the seawater! 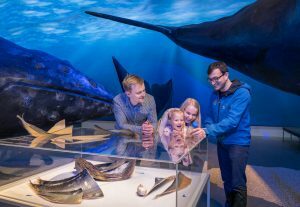 A sample of actual baleen plates at the Whales of Iceland Exhibition in Reykjavik, an amazing add-on to any whale watching tour or a perfect way to spend some time either way! Baleen whales have hundreds of these plates in their mouths, and they use the narrow gaps between the plates to filter out their food. They feed by opening their mouths wide, allowing a massive amount of seawater (along with their prey) to rush in. When the water and food are inside their mouths, they close their jaws and use their tongues to push the water out. The prey is trapped inside the mouth, held in place by the baleen plates acting as a sieve, and once all the water is expelled, they swallow everything in one gulp. Both minke whales and humpback whales belong to a group of baleen whales called the rorquals, which have pleated throat grooves. These lines run underneath their bodies, from their mouth to their navel, and allow their throats to expand like an accordion to hold an incredible amount of seawater at once – 70 tons in the case of the blue whale, the largest rorqual of all! 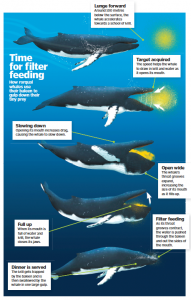 These whales repeat this process of filter-feeding throughout the day, every day. Humpback whales can consume up to one ton of fish and krill per day! This comes in handy, as they stop eating once they leave the feeding grounds and head south towards warmer waters, where they mate and give birth. The first filter-feeding whales appeared in the fossil record around 25-30 million years ago, and before that point all whale fed using teeth. Today, nearly all the whale species on Earth are toothed whales, which are also amazing in their own ways – but they will be covered in a future article! Watching these gentle giants feed in their natural habitat is an incredible experience, and something our whale watching crew never gets tired of. Join us on one of our Whale Watching Classic, Whale Watching Express, or RIB Express tours, and you might just get to witness it as well! When planning a Whale Watching tour we definitely recommend reading our blog about How to Photograph Whales.